This turkey comes out moist and so delicious with the addition of the bacon while roasting. This recipe does not account for any stuffing added to the turkey. I actually like to bake my stuffing separately. Preheat your oven to 500 degrees. Yes, you read that right, and don’t worry, you’ll see. Prepare your turkey (rinse it if you like), pat dry and place in a roasting pan. Make sure the skin from the neck of the turkey fully covers the cavity of the turkey, and that the legs and wings are tucked in. 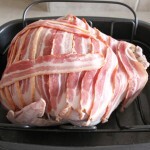 Cover the turkey with the slices of bacon, making sure it is fully covered. Then wrap the turkey tightly in tin foil. Roast for 35 – 40 minutes per 2 lbs, so a turkey of this size will need to roast for approximately to 2 and a 1/2 hours. But after about 1 and a 1/2 hours of roasting time, remove the tin foil from the turkey, and continue baking. When the turkey is done, remove it from the oven, cover it in fresh tin foil and let rest about 15 minutes, or long enough to get the rest of your dinner together. Roast for 35 – 40 minutes per 2 lbs, so a turkey of this size will need to roast for approximately to 3 and a 1/2 hours. But after about 2 and a 1/2 hours of roasting time, remove the tin foil from the turkey, and continue baking.